Striker Danny Hylton is claiming his first ever goal in League One this afternoon during Luton’s 3-1 defeat at Peterborough United. With 12 minutes remaining and the visitors trailing 3-0, it looked for everyone in the press box that Jack Stacey had volleyed in at the back post to give Town a lifeline. 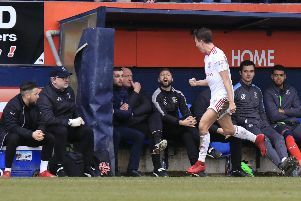 However, Hylton, who has not scored at this level before during his career, told the press afterwards it had in fact come off him, saying: “Shinnie swung it over to the back stick, Stacey’s pulled it back or shot or whatever he’s done and it’s come off my left leg. “I didn’t really know too much about it, it’s gone in the goal and I was surprised to see after the game, the goal’s given to Stacey. "It's not about me, we’ve just lost the game, but my first goal in League One, so I’m definitely claiming it. “Its been a long time coming, it's nice to get off the mark, so I'm just waiting for Stu (Hammonds, press and media manager) to contact Sky and get it changed."